Echinaforce is a traditional herbal remedy used to relieve the symptoms of Cold, Flu, Upper respiratory tract infections, Healing of wounds and other minor infections (e.g. acne). 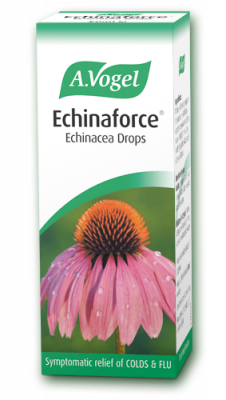 Echinaforce® Echinacea drops: This is the original extract formulated by Alfred Vogel and contains the tinctures of Echinacea purpurea herb and root. 0.6ml drops equivalent to 285mg whole fresh plant. Also contains 65%v/v ethanol. (1 ml of oral liquid contains the tinctures of: Fresh Echinacea herb 860 mg (Echinacea purpurea (L.) Moench) (1:7.5- 14.6). Extraction solvent: ethanol 65% v/v Fresh Echinacea root 45 mg (Echinacea purpurea (L.) Moench) (1:7.1- 12.5). Extraction solvent: ethanol 65% v/v 1 ml of Echinaforce is equivalent to 25 oral drops. The other ingredients used for the liquid are ethanol). Dosage of Echinaforce® drops: Adults, elderly and children over 12 years: 15 drops (0.6ml) of tincture in a small amount of water, 2 to 3 times daily.